The day after George invited me to sit with him, the Maharishi organized a group photo of all those attending the training course. Everyone dressed up, with beautiful garlands of red and saffron marigolds around their necks. 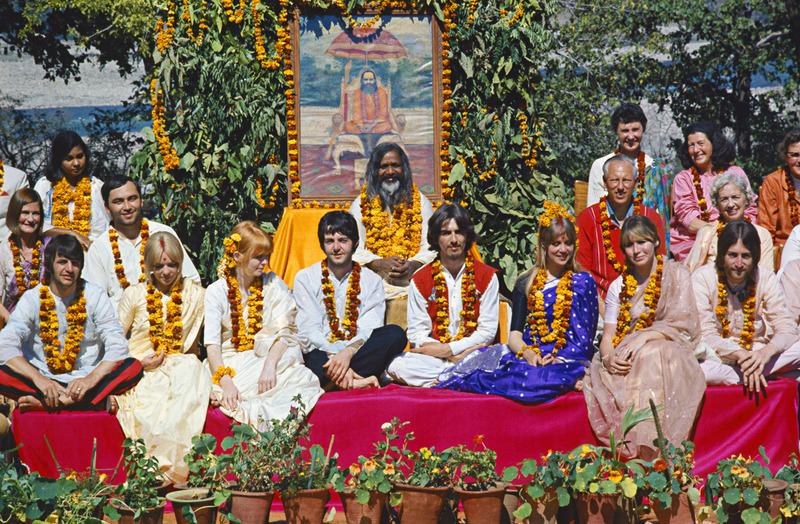 While everyone was being seated, the Maharishi sat in the shade while the photographer finished setting up. He’d had chairs placed in a circle in the shade of a nearby grove of trees where the Beatles, their partners, Jennie Boyd and Mike Love sat. Ringo was filming with his 16 mm Beaulieu camera, while the Maharishi spoke about his hopes that meditation would spread to the youth of the world. The group listened as he outlined plans to set up a university in Switzerland where meditation would be taught and where research would be carried out on the “scientifically proven benefits” of transcendental meditation. Some of the group seemed a bit bored and Paul turned around to see what I was doing behind him as I took another photo. Mal was snapping some pictures of his own from the other side of the circle. Pattie was taking pictures too. George looked at me and smiled into my camera. It felt like we both were remembering yesterday’s time together. Finally, the photographer was ready and a relaxed atmosphere of celebration permeated the next half-hour of official photo taking. The photographer was a rather stately looking man of about sixty, with a small shop in Rishikesh. He would duck under the large black cloth attached to the back of his old Thornton-Pickard wood and brass, 8×10 plate camera to focus and check the framing. Then he would come out, stand beside the camera, and call out loudly, “Ready! Now everyone look happy!” And when certain this was so, he’d press the shutter-release cable he was holding in his right hand. The Maharishi continued to direct the event, calling out to the photographer where the camera should next be placed and how many shots he wanted taken, and telling everyone, “Let everyone outside the ashram see how happy your meditations are making you!” While the photographer worked, people chatted and laughed, enjoying this festive moment like happy, excited children having their class photo taken.